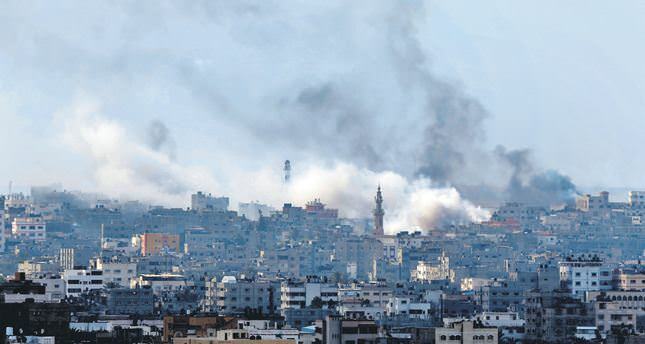 Almost all of the targets, Israel hit in Gaza were accommodating civilians. The whole world is aware of the magnitude of Israel's arms inventory and also it is known that Israel has nuclear bombs. Israel, which has many fighter jets, nuclear bombs and an advanced air defense system, has never avoided using cancer-inducing bombs that are prohibited to use like white phosphorous bombs. Former head of the Israeli parliament, Yaakov Ederi, confirmed that the Israeli army used white phosphorous bombs against Lebanon in 2006. The status of the use of white phosphorous in warfare is debatable. Israel claims that use of white phosphorous is allowed, asserting that it cannot be deemed a chemical weapon. In 2010, 37 countries signed an agreement to ban barrel bombs. Even though they might not be banned completely, they are regarded as un-ethical. During recent attacks the Palestinian Al Ray Media Agency and many other media outlets as well as activists stated that Israel used dense inert metal explosives (DIME), which are explosive devices developed to minimize damage to things that are incidental to the intended target. The bomb's effects are relatively small but with a significantly damaging blast radius, and are believed by medical experts to have severe biological effects on those hit by the bomb's micro-shrapnel. DIME has been developed by the U.S. in 2006 has been tested on Gazans, according to the website electronicintifada.net. While the Israeli occupation in Gaza and West Bank continues, the first hand-made weapons were guns called Makalazma or (Mechanism) built under very hard conditions. The Palestinians have developed the guns under difficult conditions. During the end of the occupation, various groups such as Fatah, Hamas, and Islamic Jihad illegally brought infantry and guerilla weaponry such as Kalashnikov Ak47 and American-made M16s. The most popular weapon used by organizations in Gaza is the Qassam rocket. Qassam rockets have a unique design and are easy to produce compared to other short-range projectiles. Other groups such as Islamic Jihad also use Qassem Rockets Hamas in addition to homemade rockets such as the Al-Kuds 101. The ones used by Fatah operate according to similar principles and are similar to the Qassam. The projectile has the same number of warhead compartments and according to the models used is named as Cenin, Arafat and Aksa3. Rockets used by left-wing organizations, including the El Nassar 3, are also built using similar technology. Even though they have different names, the global media, mainly the Israeli media refer to all these rockets as Qassam. All of these rockets are "fire and forget missiles" that allow manual targeting but the launch team has little control over where the projectile will end up. Some groups in Gaza use Iranian-designed Fajr 5 rockets, which are now being produced in the Gaza Strip. In 2012 Hamas and Islamic Jihad fired these missiles in Tel Aviv during an Israeli bombing campaign. According to the Israeli military, the Fajr 5 rocket has a range of about 75 kilometers. Hamas has announced that they have modified Fajr 5 and built M75s, which have a range of 80 kilometers and they have displayed the M75 to the public in Gaza. The range of M75s was later increased to 160 kilometers by the Izzadden al-Qassam's brigades, meaning that 80 percent of Israeli territory falls within its range the range. Except for Fatah, the groups in Gaza do not own Grad, which is found in Russian made multiple-barrel launchers. The Grad rocket with a 20 kilometer shooting range is being fired at the targets in Israel by being fixed somewhere permanent by Hamas and Fatah. The technical capacity and specifications and the construction technique in Gaza for R160 rockets, used by Hamas in attacks in Haifa and Jerusalem will soon become available to defense authorities. The Israeli army does not have much information on the R160s but technical specifications will be available once the rocket that hit Haifa is examined. All armed groups in Gaza have 240mm, 120mm, 81mm and 60mm mortars. Among these are some domestically produced models and some Russian variations acquired through illegal means. In Gaza, Hamas named the RPG model it manufactured as Yasin. The rocket launcher is effective up to 300 meters and was used first in 2004 during clashes in Cebaliye. The Yasin rocket launcher resembles the Russian RPG2 and technically it is similar to RPG7. Another surprise of Hamas in 2014 was its use of a drone. It was noted in the intelligence reports that Hamas was leading a project to obtain drones. The Izzaddeen al-Qassam's brigade announced that they have produced three different models of drones with four short-range miss lines placed on each of them according to the photos and videos they've posted. Israel has shot down one of the drones by using the American-designed Patriot missile system. It is not certain whether the missile system used by the Hamas' drones named Ebabil1, Ebabil2 and Ebabil3 are TV or IR guided missiles.